Chelsea bound? 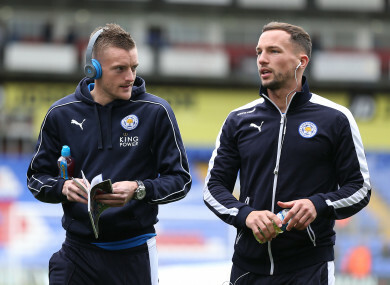 Jamie Vardy and Danny Drinkwater. A year ago, Chelsea signed N’Golo Kante from Leicester City and now they are interested in taking two more of the Foxes’ title-winning team of 2016. Blues boss Antonio Conte is reportedly keen on signing striker Jamie Vardy and midfielder Danny Drinkwater to London before the transfer window closes next week. Chelsea are in need of a proven goalscorer with Diego Costa’s days number, while they would also like to add midfield back-up after Nemanja Matic’s move to Manchester United. According to sources in Germany, Liverpool are looking at Schalke’s Benedikt Howedes as an alternative to Virgil van Dijk, who looks increasingly unlikely to arrive from Southampton this month. The 29-year-old German international, who is a former club mate of Reds defender Joel Matip, would cost around £18m. Everton lost their main goal threat in Romelu Lukaku this summer and Toffees boss Ronald Koeman has his sights set on Benfica’s centre forward Raul Jimenez. The Merseysiders have reportedly made a bid of £27.5 million for the but his club want closer to £46m for the Mexican international’s services. Huddersfield Town, who have got off to a flying start, have completed their 10th summer signing with Moroccan attacking midfielder Abdelhamid Sabiri arriving from FC Nurnberg. It’s been awhile since we saw that trademark hand-on-the-shoulder pose from Tottenham manager Mauricio Pochettino, but we’re welcoming its return this morning as Spurs announce a new deal for the appropriately named Kyle Walker-Peters. The 20-year-old full-back, who replaced Manchester City signing Kyle Walker in Spurs’ line-up on the first day of the season, has put pen to paper on a new contract, which extends his stay at the club until 2020. Meanwhile, Sam Clucas is having a medical at Swansea City ahead of his £16.5m move from Championship club Hull City. Marian Pahars arrived at Southampton from Skonto for a fee of £800,000 in March of 1999 — becoming the first Latvian to play in the Premier League. The striker found the back of the net on his home debut at The Dell and finished as the club’s top scorer in his first full season with the Saints thanks to 12 Premier League goals. Pahars became a cult hero during seven years at Southampton — notching 43 goals in 137 league appearances — including a memorable one in the 3-3 draw with Manchester United at Old Trafford. Receiving a pass from Mark Hughes, he put the ball through Jaap Stam’s legs and left him for dead before firing past Massimo Taibi. He retired from playing in 2010 and went on to manage the Latvian national team but left the position earlier this year. Email “Chelsea close in on Leicester pair Vardy and Drinkwater plus today's transfer gossip ”. Feedback on “Chelsea close in on Leicester pair Vardy and Drinkwater plus today's transfer gossip ”.